Citation Information: JCI Insight. 2018;3(19):e120596. https://doi.org/10.1172/jci.insight.120596. Characterization of myeloid-specific HO-1–knockout mice. (A) Schematics of the genomic constructs employed in the generation of myeloid-specific HO-1–knockout mice (mHO-1–KO mice). (Top) Floxed HO-1 genomic cassette, HO-1 exons 3, 4, and 5, were flanked by loxP sites, followed by a fluorescent dsRED2 gene cassette. ATG, start codon of HO-1; TAA and TAG, stop codon of HO-1 and dsRED2 gene, respectively; pA, polyadenylation mRNA; LoxP, Cre recombinase recognition site. (Middle) LysM-Cre–Tg construct; pLysM, native promoter for the lyzM gene; Cre, cre recombinase. 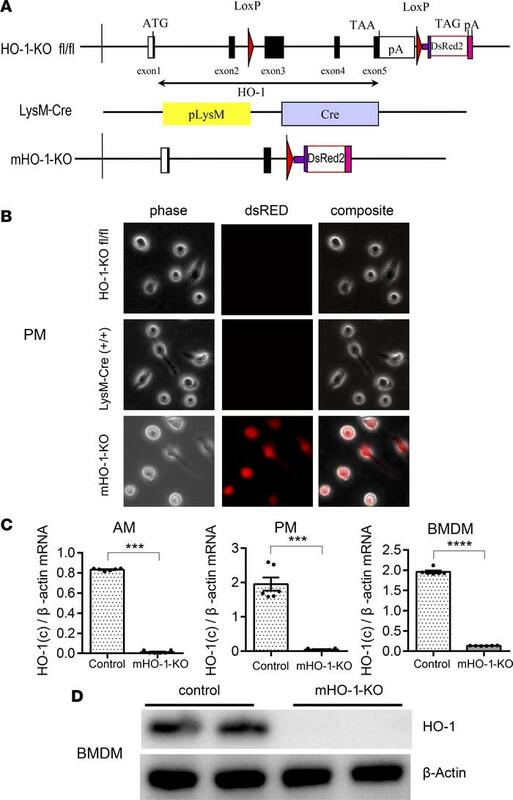 (Bottom) mHO-1–KO construct after Cre-mediated recombination. (B) dsRED fluorescence in peritoneal macrophages (PMs). (Top) Floxed HO-1 (HO-1–KOfl/fl) controls. (Middle) LysM-Cre. (Bottom) mHO-1–KO mice. Phase, phase contrast; dsRED, red fluorescence channel; Composite, overlay images of both channels. Original magnification, ×200. (C) mRNA expression in alveolar macrophages (AMs) (left), PMs (middle), and bone marrow–derived macrophages (BMDMs) (right) in mHO-1–KO compared with controls (n = 6/group). Data are presented as mean ± SEM (scatter dot blot). Statistical analyses were done with 2-tailed Mann-Whitney U test. ***P < 0.001; ****P < 0.0001. (D) Representative immunoblots for HO-1 and β-actin in BMDMs from mHO-1–KO mice and controls.